Did I mention that Zoolander wants to be a scientist when she grows up? Let’s just say that her favorite gift from Santa this year was a plastic human skull. It started in 1st grade. Before that, she claimed that she wanted to ‘hunt bears’ for a living. She changed her mind after she did her Science Fair project on the quality of our water. I called the Water Department and asked if she could test the water at their lab. Both scientists in the lab that day were women and they were delighted to suit-up a somewhat toothless, 6-year old Zoolander in a real grownup lab coat, roll up her sleeves and let her go to town. They were so kind and helped her through her experiment, while Zoolander grinned from ear to ear. She loved it and was hooked. She then became obsessed with blood and the human body. One of her most thrilling experiences came at the age of 7, when the nurse at the doctor’s office let Zoolander help test her own urine. Livin’ the dream, baby! Almost every book Zoolander checks out the library at school has something to do with the human body or blood. She really likes books with pictures, especially if they are gross. They had a reading contest at school with books for prizes… Zoolander ordered ‘An Introduction to Genes and DNA’. Last summer, on the first day of camp, her counselor asked Zoolander which Disney Princess was her favorite. No response. Awkward silence. So, the counselor tried asking her what book she had read last and was a little caught off guard when Zoolander shyly replied, ‘Solving Crimes with Forensic Science’. Zoolander sleeps in a pile of her science books. She especially loves the series of ‘Horrible Science’ books, which are illustrated with funny Mad magazine-style cartoons. 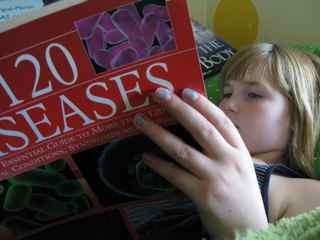 Her favorite is ‘Blood, Bones and Body Bits’, but recently asked me to order ‘Chemical Chaos’. So, last weekend, I found mold on some food in the kitchen. (don’t ask) Zoolander was psyched and begged me to let her keep some. She was all out of petri dishes, so she put some mold in a jar. She decided it needed water and then maybe some flour and then maybe a little sugar. Then, because her father had so carelessly thrown away a previous jar that contained moldy cheese, she made a special label for her new mold jar. I am not a scientist, and I can’t keep up with her curiosity, so I try to find enrichment opportunities for Zoolander. I know she’s a visual thinker, because she tells me that she has a DVD library in her head and when she’s bored at school she selects a movie and watches the entire thing. Great. Anyway, here is some of the fun science stuff she loves that other visual learners might enjoy. 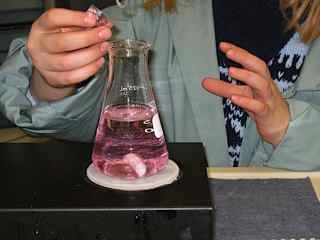 *Mad Science-A hands-on after school science program. This is the highlight of her week. *CU Wizards-Fun and free monthly science show for kids at the local university, which features lots of soda geysers and other kid-pleasing explosions. *Usborne books-Lots of colorful non-fiction titles with beautiful illustrations. *Horrible Science-Fun UK book series. *3B Scientific-Online site for all your human anatomy and plastic skeleton needs. Zoolander’s obsession with science and her strong visual memory make me think of an interview I did with a scientist named Tom. Tom describes himself as a visual thinker who definitely knew at an early age what he wanted to be.